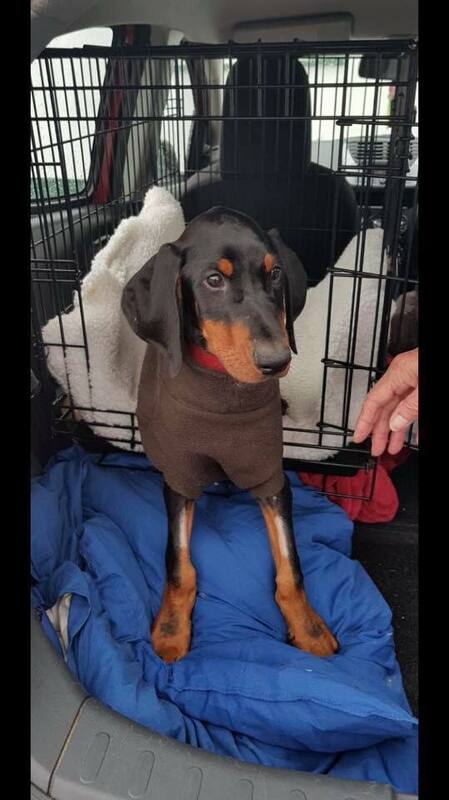 HAVING battled to save a very ill Doberman puppy, Green Acres Animal Rescue have announced that he has been discharged into a foster home. On September 3, Green Acres Animal Rescue Manager Mikey Lawlor was told about an ill Doberman in desperate need of treatment. The 10-week-old dog was severely dehydrated with obvious gastrointestinal problems, and so was hospitalised. Mikey christened him Remus as he was put on a heat pad and drip, before the next day’s scans forced the vets to take urgent action. Green Acres Animal Rescue said: “He had an abdominal scan which revealed he had some thickening of the intestine and our vets suspected Intussusception of the bowel. Emergency surgery was needed but our vets feared it may be too late and gave a very guarded prognosis. Since then Remus has made a remarkable recovery. By September 6, having taken his medication, Remus’ drip was removed. On September 7, the feeding tube was removed as Remus had developed a healthy appetite. His blood test was similar to that of a normal dog, and he was starting to maintain weight. On September 7, Mikey said on Facebook: “Liz Price of DRUE (Doberman Rescue UK and Europe) has been an amazing support and Julie Grabham both have listened to me and offered words of support and with Liz forming a forward plan for him. Local doberman owner Lesley Lewis and proprietor of The George’s restaurant has also been drumming up support for this special lad! “Huge thank you to everyone that’s donated we are currently at a total of £2,234 and his bill is £2,500! Special thanks to Al Rees, Liz Clarke and Angela Smithers of local group Dog Friendly Pembrokeshire for their generous donation of £676.25. On September 8, Mikey went onto say: “Remus has been discharged today into foster care just a few minutes from the practice. A later update said: “All is going well he’s bright and active but he has lost 100g, our vets are not overly concerned all things considered. He was so happy having lots of attention today at Fenton Vets, even took a small treat off the practice manager!